This is where you will come to find all of the latest updates we have done to the site. If you want to see if we have posted anything new to the sight and/or the latest news surrounded the team itself, this is the place to be! The Hawks have been on the move during this off-season! The ripple effect of hiring a new coach has trickled down to securing a new-look roster for the upcoming season. While the familiar faces of Al, Jeff, Kyle, John and Mike are sure to be seen at Philips Arena yet again, the Hawks have done quite a bit of damage on the roster front. Fans welcomed Paul Millsap, Elton Brand, Gustavo Ayon, DeMarre Carroll, and rookies Mike Muscala, Lucas Nogueira, and Dennis Schroeder (or Schröder). The rookies already made an impact on fans with their play in the Las Vegas Summer League, even though they came home earlier than hoped. The Hawks have sent Muscala and Nogueira to Spain to work on improving their NBA readiness. We will greatly miss the contributions of Josh Smith (Pistons) and Zaza Pachulia (Bucks) as well as those who will not be returning after a season during which many critics had the Hawks pegged to miss the entirety of the playoffs. The Atlanta Hawks welcomed new Head Coach, Mike Budenholzer, to the team at a press conference on May 29, 2013. Coach Budenholzer spent 19 seasons with the Spurs and the last 17 seasons as their assistant coach. Joining Coach Budenholzer are Quin Snyder and Darvin Ham as assistant coaches. We would like to thank Coach Larry Drew for his contributions to the team throughout these past seasons and wish him luck on his future position as head coach for the Milwaukee Bucks. The Atlanta Hawks clinched their sixth playoff berth with a 44-38 season record. Many critics did not have the team making a playoff appearance at all this season. Unfortunately, the Hawks fell to the Indiana Pacers after an intense series of six games. ATLANTA – US Road Sports & Entertainment Group, owners and operators of the Publix Georgia Marathon, has announced a sponsorship agreement with the NBA’s Atlanta Hawks. The partnership will bring a unique and fun way for those interested in registering for the Publix Georgia Marathon to receive a discount based on the outcome of two Hawks home games during February. Registration can be completed online at www.georgiamarathon.com. To see any of the three home games live at the Highlight Factory, visit www.hawks.com/tickets to purchase your tickets today. January 14 - The Hawks took on the Chicago Bulls tonight in what was the ugliest loss of the season. There's no need in dwelling on this loss for too long but you can read a little more about it on the GameDay Highlights page. January 12 - John Wall made his season debut tonight and had a pretty good showing in his first game back. Was his effort good enough to carry his team to victory? Find out here. January 11 - This was a GOOD one between former Hawk Marvin Williams and the Utah Jazz and the Atlanta Hawks. The Hawks pulled out a much needed 103-95 win at home. You're gonna want to head over to GameDay Highlights for the details. January 9 - Josh Smith summed up tonight's loss against the Cavs by saying "Things aren't going too good for us right now. You're going to have struggles like this throughout the season. We've got to get back to playing beautiful basketball." Right on, Smoove. GameDay Highlights has a brief summary of the 99-83 loss. January 8 - The Timberwolves handed the Hawks their 3rd-straight loss which led to Larry Drew labeling their play as "soft". Check out the other details here. January 5- The Hawks were ahead by 15 at halftime but they lost by 8. What happened in between the third quarter and the final buzzer can be found on the GameDay Highlights page. Final Score: 89-81 Celtics. January 4 - There's just something about those pesky Pistons that aggravates us. It was another battle against these familiar foes. GameDay Highlights has the outcome for you. January 2 - The Hawks grabbed their 5th win in 6 games last night against the New Orleans Hornets. Go to GameDay Highlights for a quick recap. Final Score: 95-86. January 1 - Happy New Year Hawks fans! We're happy to announce lots of new additions to the site including some Did You Know facts, Community updates, and interviews! Be sure to check them all out! December 31 - The Houston Rockets handed the Hawks an ugly loss tonight. If you really want to re-live it all, then head on over to the GameDay Highlights. If not, then the Hawks will be back in action on New Years Day to face the New Orleans Hornets! December 30 - Check out some post-game interviews from last night's victory of the Pacers! December 29 - The Indiana Pacers were in town to face the Hawks. A Hawks team with only 9 available players. Our leading scorer sat out of tonight's contest. So how did the Hawks stack up against Indiana? The answers. December 28 - The Hawks grabbed yet another tonight against the Cleveland Cavaliers. Jeff Teague played a HUGE factor in tonight's game. Read all about it here. December 26 - A double overtime thriller against the Detroit Pistons! Wait, what!? You'll have to head over to GameDay Highlights to see how it happened. December 23 - Atlanta native Josh Smith treated several kids to some great holiday fun today at Dave & Buster's. Read all about it on our Community Players page! December 21 - Lou Williams faced his former team at Philly and the game turned out to be a little more ugly than everyone would have liked. The stats are on GameDay Highlights if you care to dwell on it, if not then check back here on Saturday night after the Hawks face the Bulls! December 19 - The Oklahoma City Thunder were in town seeking revenge against the Hawks who beat them in OKC earlier this season and also at Philips last March. Check the gameday highlights to see who walked away with the win. December 15 - The Golden State Warriors were in town and they came to play. They capped an impressive 7-game road trip with a 115-93 win over the Hawks. Gain closure here. December 13 - The Hawks defeated the Charlotte Bobcats (yet again) with a 113-90 win. Head on over to GameDay Highlights to read about it. December 12 - The Hawks got back in the win column tonight against the former rivals - the Orlando Magic. After reading the game summary, be sure to head on over to Fan Voice and read some entertaining tweets regarding Zaza Pachulia's almost first NBA 3-pointer. December 10 - The Miami Heat hosted the Hawks and handed them their 2nd loss in 11 games. Read the game summary to see where the Hawks went wrong. December 6 - The Hawks are having a GREAT season thus far. Don't believe us? Head over to the gameday highlights page and check the season schedule in order to catch up. 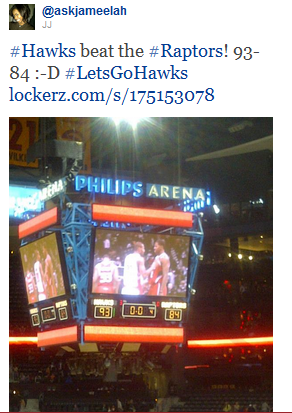 November 28 - The Hawks took on the Charlotte Bobcats yet again - this time at home - in a *really* close game. Head over to the gameday highlights page to see who came out with the W.
November 24 - Hawks were looking to extend a win streak and Clippers were hoping to end a losing skid. Find out which team's streak continued. November 23 - The Hawks took on the Charlotte Bobcats tonight. Don't sleep on the Bobcats just yet - they're not the same as last year. Last season they were 7-59 but this season they're already 6-4. Well make that 6-5 because the Hawks got it done against them :) Final score: 101-91. Go ahead and check out the summary. November 21 - Incredible finish by the Hawks in tonight's 101-100 overtime victory against the win-less Washington Wizards. Check out the summary on our gameday highlights page! November 16 - The Hawks ended their west coast road trip with a bang by defeating Sacramento 112-96. Kyle Korver shot the lights out. Read about it here. November 14 - The Hawks dropped a close one to Golden State tonight without the services of both Al Horford and Devin Harris. Check out the game story if you couldn't hang around for this late night matchup. November 12: The Hawks faced the Portland Trailblazers in their first back-to-back of the season. This one looked like it was going to end badly but the Hawks prevailed! Final Score: 95-87. Read the story behind the score here. November 9 - The Miami Heat were without Dwyane Wade but still managed to walk away with a win against the Hawks. Find out how on our gameday highlights page. Also, find out what special guest provided some color commentary alongside Bob Rathbun during the first half. Check out the highlights from tonight's impressive fourth quarter comeback against the Indiana Pacers! Warning: The stats are a little mind blowing. November 4 - The Hawks flew into OKC's nest and left with their first W of the season. No Smoove? No problem. Check out the highlights here. November 2 -Hawks fall in season-opener to the Houston Rockets thanks to hot-handed James Harden. Check out the highlights and find out just how many points Harden went off for. October 29 - The Hawks have been very active in the community lately from renovating courts, surprising high schools, and taking over the Varsity to serve Atlanta. See what they've been doing on our Community Players page! October 24 - As a thank you to the fans, the Atlanta Hawks paid everyone's toll on GA 400 from 7-9am! More details here. October 22 - Check out how the Hawks fared during the preseason. The countdown to the regular season is ON! October 17 - The Atlanta Hawks Fan Site hosted its first fan giveaway! We gave away three pairs of tickets to three lucky winners who were given the opportunity to catch the Atlanta Hawks take on the New Orleans Hornets in a pre-season matchup. Stay tuned for more giveaways throughout the season! The new season is upon us! With that comes many new players on the roster and more events featuring your team. October 7 -Preseason home opener vs the Miami Heat. Basketball is back! See the Hawks play at 2pm. 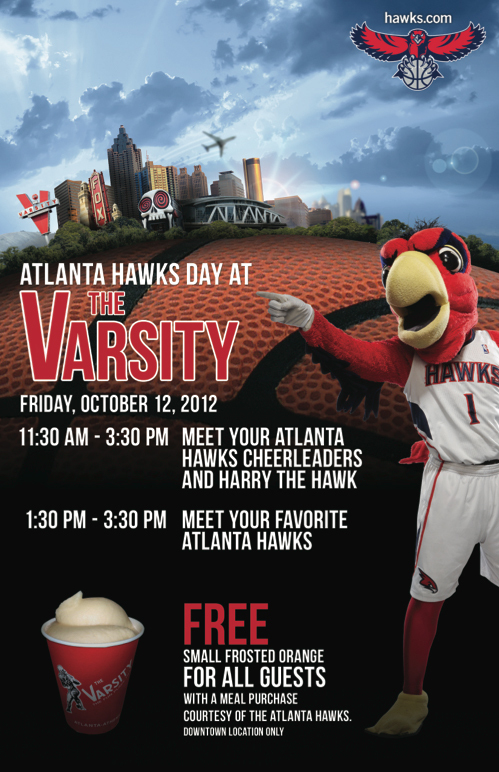 October 12 - "Atlanta Hawks Day" at The Varsity! Come out and meet the players! Please check out our exclusives with former Hawk "The Difference" bka Jamal Crawford, the voice of the Atlanta Hawks, Bob Rathbun, and the (now former Hawk) defensive master Damien Wilkins! Also be sure to check out our latest interview w/ Head Coach Larry Drew as he taught campers what he knows about on and off court activities! -Check out the Hawks schedule for 2012-2013 right here! -The Atlanta Hawks Fan Site would like to wish Joe Johnson and Marvin Williams the best of luck in the next phases of their career. Joe Johnson put Atlanta on the map when he decided to come here and we will be forever thankful for his contributions. Both guys are class acts and their new teams, the Brooklyn Nets and the Utah Jazz, will be lucky to have them. -DRAFT NIGHT! With the 23rd and 43rd picks of the draft, the Hawks selected Vanderbilt's John Jenkins (G) and Mike Scott (F) of UVA. Welcome to the team, guys! Check out what some fans are saying about our picks on our Fan Voice page! =Watch below as we caught up with Head Coach Larry Drew as he taught campers what he knows about on and off court activities! -Thank you ALL so much for riding with The Atlanta Hawks Fan Site for our first year off the ground. We look to get better in the postseason and come back even stronger and better next year. (Just like our Hawks)! Stay tuned for periodic updates! -This series is going back to Boston!! That's right, there WILL be a game 6! The Hawks showed true heart in tonight's 87-86 victory over the Boston Celtics. Al Horford and Josh Smith gave their all tonight despite their respective injury statuses. Check out the notes here and get ready for Thursday! -Game 4 was a disaster. The Hawks went down 101-79 in a game that seemed like it was going to last forever. The Celtics had complete control of the game by halftime. If you are interested in reading more about it, you can find the notes here. Otherwise, we look forward to Game 5 in Atlanta! -With Game 3 being in Boston, the Hawks knew they were up for a challenge - especially since they were without Al Horford, Josh Smith and Zaza Pachulia. This one needed more than the time in regulation but the wheels fell off for the Hawks in overtime. The C's went up 2-1 in the series with a 90-84 victory in Game 3. The Hawks look to redeem themselves in Game 4. For more news and notes, click here. -Game 2 of the BOS-ATL series didn't go quite the way we wanted it to. The Hawks lost 87-80 and lost their lead in the series. Find out which key Hawks player suffered in the injury in the fourth quarter in the game notes. -Check out the article Melanie wrote before Game 1 of the BOS-ATL series. "Familiar Foes: Hawks vs. Celtics"
-Horford will sit out during the first round and we're not sure when we're going to get Zaza back. Everyone else is ready to go. -They also clinched the 4th seed in the playoffs, giving them home court advantage against their former nemesis, the Celtics. -April was a good month of basketball for the Hawks. They went 9-3 and captured big wins against Orlando, Boston, the Clippers and the Mavericks. Be sure to catch up on all the gameday highlights. -The Hawks looked to bounce back from a disappointing loss against the Bucks the night before but the fatigue is still a huge problem. This was their fifth game in six nights and despite the fact that the Bulls were without Derrick Rose, they still lost. It should be noted that the Bulls didn't even NEED Derrick Rose. See why here. Final Score: 98-77. -The Hawks faced the Bucks on Tuesday night but they couldn't muster up enough energy to contain Monta Ellis. Final Score: 108-101. Check out the notes. -FOUR overtimes. Won. On the 3rd game of a back-to-back-to-back and the 2OT game in the past 4 games. That's all you need to know. If you have the energy, check out the details of this exhausting game. Final(ly): 139-133 4OT ! -Consecutive win #2 for the Hawks came courtesy of the Washington Wizards on Friday night. The Hawks sent the Wizards home with a 102-88 loss. Check out the notes from this game. -The Hawks grabbed a hard fought win over the Cavs on Wednesday! Final Score: 103-102. Check out the notes! -The Hawks took a tough 79-76 loss to the Boston Celtics on Monday night. It was a really crazy game. Read about it here. -After playing one game at home, the Hawks were back on the road to take on Kyrie Irving and the Cleveland Cavaliers. The Hawks had the Cavs right where they wanted them for the entirety of this game. You might want to check out the highlights! -The Hawks handled their business against the Washington Wizards on Friday night at home. Check out the highlights here. -The Hawks were sluggish tonight against Blake Griffin and the Los Angeles Clippers. They fell to the Clippers 96-82. See how the game went. -The Hawks dropped a real heartbreaker to the Nuggets in overtime. Final Score: 118-117 OT Nuggets. See how it all went down. -After the past two very close losses, the Hawks finally closed out a game against the Sacramento Kings. It was a great collaborative effort tonight for the entire team. Final Score: 106-99! Find out how the Hawks put this one together right here. -Tonight the Hawks will go toe to toe with the Detroit Pistons who defeated the Los Angeles Lakers the other night. Stay tuned here to see how they will fare against their former teammate, Damien Wilkins! **Update** The Hawks came ever so close to taking down the Pistons. They lost by a mere point. Final Score: 86-85. Read up on it here. -The Hawks suffered a tough loss late in Miami. See how close the Hawks came to walking away with the victory here. -On Tuesday night, the Hawks took down the Indiana Pacers 101-96. This was the fourth win in the past five games. Check out some notes from the game! -Have you checked out our new updates for the month of March? New Did You Know and Around the League! -March 3: Riveting Hawks win as they took down the Oklahoma City Thunder, 97-90! Quarter-by-quarter action in our Gameday Highlights section. On Monday, February 27th, the Atlanta Sports Awards took place at the Fox Theatre. Our very own Dominique Wilkins and Al Horford were honored at the awards ceremony. 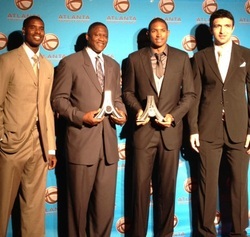 'Nique took home the 2012 Lifetime Achievement Award while Al Horford was named the Sports Person of the Year for his work in the community. At the Hawks vs. Thunder game on March 3rd, Bob Rathbun was honored at halftime for winning the 2011 Georgia Sportscaster of the Year Award. Congratulations to all three of these outstanding gentleman on being recognized for their achievements! 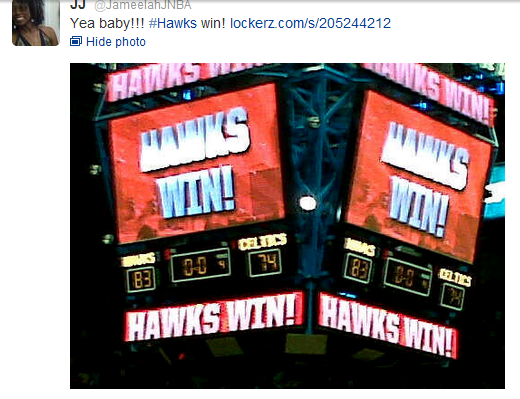 -March 2: Great Hawks win against the Bucks! Re-live that excellent comeback win by clicking on this right here. -February 29: Tough loss to the Golden State Warriors. Check out the update here. -February 23rd: The Hawks took on the Orlando Magic on the second of a back-to-back before the All-Star break. We pulled out an impressive 83-78 victory against them despite the absence of Joe Johnson, Al Horford and Jason Collins. Our reserves came up HUGE for us tonight. Check out the exciting game story! -Joe Johnson will not be participating in this year's All-Star weekend due to tendonitis in his knee. While we wish that we could represent for the Hawks in Orlando this year, we would not wish for him to add insult to injury. We wish Joe Johnson a speedy recovery, along with the rest of our injured players! -February 22nd: The Hawks faced the talk of the NBA, Jeremy Lin, tonight at Madison Square Garden. He lived up to the hype and scored 17 points and 9 assists on the Hawks. Check out the rest of the story behind tonight's loss here. -February 20th: The Hawks lost to the Bulls in Chicago 90-79 on Monday night. Look at the stats behind the score here. -February 18th: The Portland Trailblazers took down the Hawks on their last game out West before All-Star weekend. Final Score: 97-77. Learn what happened here. -February 15: Hawks won against the Phoenix Suns on the Suns' home court! 101-99 was the score of this spirited contest. Didn't catch the craziness? Here's your recap. -February 14th: Hawks fall to the Los Angeles Lakers at their Staples appearance. If you missed it, check out what happened here. -February 12th: The Heat came back to town and handed the Hawks another ugly loss in the Highlight Factory before they embark on a road trip out west. The final score was 107 - 87. See what happened. -We were ALL shocked that Josh Smith was not voted into the All-Star game this year. Check out the strong reactions on our Fan Voice page. 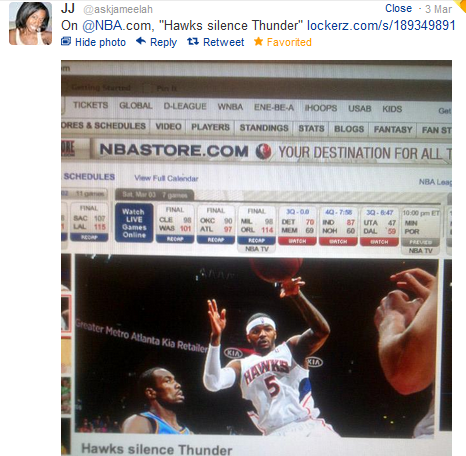 -The Atlanta Hawks Fan Site would like to congratulate Joe Johnson on his sixth straight All-Star appearance! -February 8th: The Hawks grabbed a much needed win against the Pacers tonight. Final Score: 97-97. Be sure to check out the highlights from the victory. -February 6th: Steve Nash and the Phoenix Suns handed the Hawks their third straight loss at home. See where the Hawks went wrong here. -You may know of Lang Greene through twitter & HoopsWorld. We had a chance to get to know him better and talk about the Atlanta Hawks. Check it out under "In Their Own Words"
-February 4th: The Hawks looked to forget about Thursday's loss to the Grizzlies and remember their second half against the Sixers last week tonight as they faced Philly again. Unfortunately, they suffered their second consecutive loss. Check out the game summary to find out why. -February 2nd: The Hawks suffered a loss at home in their first game back at the Highlight Factory after going 4-1 on the road. See what led to their loss against the Grizzlies here. -New month means new updates. We have some new DYK facts up and so much more to come in the next few days so keep checking back! Send Your Atlanta Hawks To The All-Star Game! You may now vote for your Atlanta Hawks to be in the 2012 NBA All-Star Game! Vote daily here. -January 31st: The Hawks took out the Raptors on their last stop before Atlanta. Final Score: 100-77. Stellar stuff from various Hawks players. Check out how it went down here. -January 29th: Your Atlanta Hawks went into New Orleans and handled their business with a 94-72 win. This was a fun one. Treat yourself to the highlights of the game then head on over and catch some reaction from Hawks fans. -January 27th: It looked like the Hawks were going to walk away with a L in Detroit up until Joe Johnson with the help of his teammates rallied back to beat the Pistons in OT. Hawks won 107-101! Check out the news & notes. -January 25th: Unfortunately for the Hawks, history repeated itself as they lost 105-83 in San Antonio. See exactly what we're talking about at the GameDay Highlights page. -January 23rd: The Hawks were able to start off their intense 5-game road trip with a W tonight against the Milwaukee Bucks. One player in particular played a HUGE role in getting the Hawks over the hump. See who it was on our GameDay Highlights page. -January 21st: The Hawks definitely turned things around tonight with a solid 121-94 victory against the Cavaliers. Lots of cool stats from this game -- read up on them here. -January 20th: The Hawks traveled to Philly to take on the 76ers who snapped their four-game winning streak. The final score: 90-76. Find out where the Hawks went wrong on our GameDay Highlights page. -January 18: Jamal Crawford returned to the Highlight Factory for the first time in a Blazer uniform. He gave us an exclusive FIRST interview - be sure to check it out HERE! He dropped 20 points on the Hawks but it wasn't enough. The Hawks defeated the Blazer 92-89. Check out the game summary on our GameDay Highlights page. for news and notes on how this win was made possible, please refer to our GameDay Highlights page. GO HAWKS! -January 14: The Hawks faced Ricky Rubio and Kevin Love tonight. See how well they fared against this super duo on our GameDay Highlights page. -January 12: After finding out that they will have to play without their center Al Hoford for the majority of the season, the Hawks rallied together and knocked down the Bobcats 111-81. Find out more regarding how they did it on our GameDay Highlights page. -January 11: The Hawks fell to the Indiana Pacers 96-84. Al Horford also suffered a devastating injury. Check out the GameDay Highlights page for a summary of what happened. -January 9: The Hawks went 3-0 against the New Jersey Nets but taking them down 106-101. It was yet another great game for J-Smoove! This was also the last time ever that the Hawks will face the Nets in New Jersey. Check out the game summary on our GameDay Highlights page! -Have some Hawks-related photographs you want to share? Submit them to atlhawksfans@gmail.com for the Gallery page! -January 7: Your Atlanta Hawks take on the Chicago Bulls tonight seeking revenge for their very disheartening loss 4 days ago. Stay tuned here for the final outcome! **UPDATE: The Hawks slayed the Bulls 109-94. GREAT GAME from start to finish. We have lots of news and notes on our GameDay Highlights page. -January 6: The Hawks win in their 2nd (OT) game of a back-to-back-to back in Charlotte. Tracy McGrady sat out to rest his knee. Check out some notes from the game - available on the GameDay Highlights page. -January 5: The Hawks faced the Heat at home without LeBron or Wade and lost in 3 overtimes. If you STILL want to know what happened, head on over to the GameDay Highlights page. -We've added some new Did You Know facts for the month of January! Get to know your Hawks! -January 4: The Hawks suffered a disappointing loss against the Chicago Bulls. If you can stomach it, take a look at some brief notes from the game on our GameDay Highlights page. -January 2: In the first game of the new year and after their first loss, the Hawks handed the Miami Heat their first loss of the season! Head over to the GameDay Highlights for a recap and then re-live the excitement on the Fan Voice page! -December 31st: The Hawks were handed their first loss of the season by the Houston Rockets. Check out the story behind the score - only on the GameDay Highlights page. -December 30th: Hawks are now 3-0 after taking down the New Jersey Nets (once again). For the skinny on how the game looked, head on over to the GameDay Highlights page. -New! Check out the Player of the Week update to learn something you might not have known about a Hawks player! -December 28th: TONIGHT the Hawks make their regular season debut at the Highlight Factory! Get there early to cheer on our guys and if you can't make it, you know you can always watch the action unfold on SportSouth. LET'S GO HAWKS! ^^^Final Result: Hawks Win! 101-83. Be sure to check out the notes on the GameDay Highlights page! -December 27th: The Hawks hit the Nets square in the jaw tonight! Final score: 106- 70! Check out the GameDay Highlights page for notes & stats. -The Hawks have been doing several things in the community this holiday season. Keep up with all there projects here! -It was reported that Jeff Teague turned his ankle in the last practice of Training Camp. Currently he is listed as day-to-day. - Who is that?! There are some new faces on the team. Check out the GameDay Highlights page for the Training Camp Roster. - December 19th: The first Hawks Preseason game is in the books! The Hawks came so very close to walking out with the W but were edged out by the Bobcats in the final minute of the game. Bobcats won 79-77. Check out the GameDay Highlights page for game notes. -The Hawks have signed Tracy McGrady and Vladimir Radmanovic to the team. Jason Collins has been re-signed. Damien Wilkins was not resigned and is now a member of the Detroit Pistons. -Hawks Training Camp has started. Check out our camp summary on the GameDay Highlights page! -We've posted the 2011-2012 Hawks season schedule! You can keep up with the Hawks and their wins & losses HERE throughout the season. - Josh "J-Smoove" Smith shows up to a voluntary workout at Philips Arena, more info to come! - The AJC has reported that Kirk Hinrich recently had shoulder surgery and will not be able to play until late December of January. This means that Jeff Teague will be the only point guard on the roster at the start of training camp on Dec. 9th. He will be the starter for our two preseason games against Charlotte and for the beginning of the season. It will be interesting to see if Teague can pick up where he left off after his exciting play in the second round of the playoffs this past summer. -New Comprende? update, brush up on those Spanish skills! Via Nba.com....THE NBA LOCKOUT IS OVER!!! Basketball's back! Make sure you stay tuned with us all throughout the season for fan coverage! GO HAWKS!! New Did You Know, Around the League updates, and videos on the Multimedia page! Also, Team SportSouth bios have been added. Updates are being added to the Community Players page, keep checking back!